Alfa Romeo has launched its first SUV in more than 100 years: the All-New Stelvio. The Alfa Romeo Stelvio comes hot on the heels of the exclusive ‘first edition’ and the range-topping Quadrifoglio, seen for the first time at LA Auto Show. Available in three trim levels - Stelvio, Stelvio Super and Stelvio Tecnica – it will initially be available with a choice of a 280hp 2.0-litre Turbocharged petrol or a 210hp 2.2-litre Diesel engine, both combined with an 8-speed automatic transmission and Q4 all-wheel drive. The Alfa Romeo Stelvio version is lavishly equipped with 17-inch alloy wheels, 8.8-inch Alfa Connect, Alfa D.N.A Rotary selector, 8-speaker audio system, black fabric seats (front with sliding, reclining and height adjustments), Integrated Brake System (IBS), Lane Departure Warning (LDW), and Forward Collision Warning (FCW) with Autonomous Emergency Brake (AEB) and pedestrian detection. This version also includes parking sensors, cruise control, electric tailgate and dusk and rain sensors. 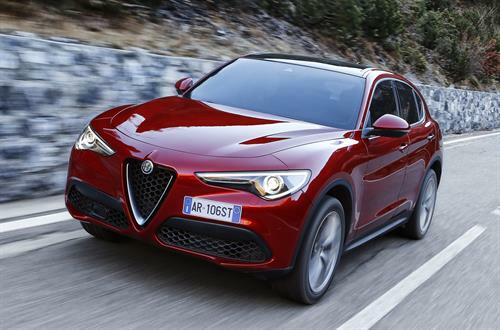 The Alfa Romeo Stelvio Super version builds on this with additional interior and exterior features: 18-inch alloy wheels, techno-leather and fabric seats in a choice of three colours (black, black/brown and black/red), and three options for the dashboard and door panels (black, black/brown or black/red) and door sills with steel inserts. An additional Luxury Pack and Sports Pack are also available to customers looking to go the extra mile. Alfa Romeo Stelvio Super’s Luxury Pack includes full grain leather seats (in black, brown, red or beige) with electrical adjustment and heating system, as well as real wood inserts. The Sport Pack comes with heated sports steering wheel, specific grip and leather wrapping, racing-style leather seats in black, red or brown, with electric adjustment and heating system, aluminium inserts and steel pedals. The introduction of Alfa Romeo Stelvio Tecnica offers a strong proposition to fleet, corporate and professional customers. Exclusively available with the Diesel engine, it features the 8.8-inch Alfa Connect 3D Nav, Bi-Xenon headlights with AFS and electric folding mirrors. Built in Italy at the Termoli (petrol) and Pratola Serra (Diesel) plants, in areas assigned only to Alfa Romeo engines, with state-of-the-art processes and methods that put them at the top of their class in terms of performance and fuel economy, are the engines housed under the bonnet of the Alfa Romeo Stelvio. The 280hp 2.0-litre Turbocharged petrol and the 210hp 2.2-litre Diesel engines are combined with an automatic 8-speed transmission and Q4 all-wheel drive. The new 2.0-litre Turbocharged petrol engine, offering 280hp, is a 4-cylinder unit built entirely of aluminium with carbon drive shaft, combined with the automatic 8-speed transmission and Q4 all-wheel drive. In addition to electro-hydraulic valve actuation, the distinctive features of this engine include "2-in-1" turbo and 200-bar high-pressure direct injection which pair up to deliver a full-throttle response across the rev range in addition to first-class fuel-efficiency. This results in a peak torque of 400Nm at 2,250 rpm and offers best in class acceleration, going from zero to 62mph in just 5.7 seconds and onto a top speed of 143mph. 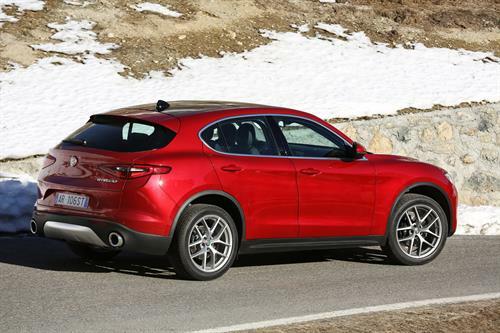 The Alfa Romeo Stelvio will also be available with a 2.2-litre Diesel engine – available with two power outputs: 210hp at launch and 180hp following shortly after. It is the first Diesel engine in Alfa Romeo's history to be constructed entirely in aluminium. This in-line four cylinders engine features the latest-generation injection system with Injection Rate Shaping (IRS) and operating pressures of 2,000-bar. The electrically-operated variable geometry turbocharger offers state-of-the-art mechanics and a turbocharger speed sensor to minimises response times and improves efficiency. The Alfa Romeo Stelvio 210hp 2.2-litre Diesel reaches a top speed of 133mph and accelerates from zero to 62mph in 6.6 seconds. Both Alfa Romeo Stelvio SUV engines are teamed with the ZF automatic 8-speed transmission, specifically calibrated for fast, smooth gear shifts. The automatic transmission work with the Alfa D.N.A selector to optimise fluidity, comfort and ease of driving in all environments and helps to further improve fuel economy and CO2emissions. Steering-column-mounted, aluminium paddle shifters are also available. Inspired by Italy’s highest mountain pass – an epic 20 kilometre driving route with more than 75 hairpins – the Alfa Romeo Stelvio has been built to offer an engaging driving experience while still maintaining the driver’s comfort. The new SUV boasts handling worthy of a sports car with exclusive AlfalinkTM technology – the most direct steering ratio in the segment and state-of-the-art suspension. Combined with ultra-lightweight, hi-tech materials, such as carbon fibre for the drive shaft and aluminium for the engines, suspension systems, hood, wings, doors and the tailgate, the car can boast sector leading handling and the Alfa Romeo Q4 all-wheel drive system. Driving comfort has been optimised though the perfect weight distribution between the two axles – a distinctive feature of Alfa Romeo’s. Managing the weights and materials, including adjusting the car's layout by placing the heaviest units in the most central positions, have helped achieve this 50/50 weight distribution. Light-weight materials reduce the SUV's total weight and provide excellent torsional rigidity, a quiet ride and exceptional handling even in extreme conditions. A new double wishbone suspension with a semi-virtual steering axis, optimising the filtering effect and guaranteeing rapid, accurate steering, was developed for the front suspension. The rear suspension uses a four-and-a-half link system – patented by Alfa Romeo – to deliver extremely precise control of the wheel's characteristic angles. The Alfa Romeo Stelvio SUV has the most direct steering ratio in its segment delivering a natural, instinctive feel. 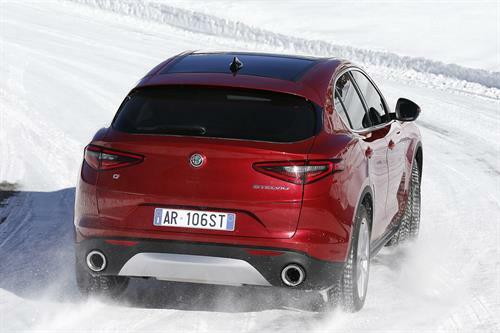 Thanks to the Q4 all-wheel drive system, with rear-wheel-drive bias, the Alfa Romeo Stelvio is capable of conquering a mountain hairpin, gravel track or snow-covered roads. Its architecture includes an active transfer case and front differential designed to give rapid-response management of high torque levels and a compact, lightweight set-up. The Q4 system continuously monitors numerous parameters to optimise torque distribution between the two axles according to what the car is doing and how much grip the road surface offers. In normal grip conditions the Alfa Romeo Stelvio acts like a rear-wheel-drive vehicle with 100% of the torque sent to the rear axle. As the wheels approach their grip limit the system transfers up to 50 per cent of the torque to the front axle. This translates into best-in-class control in terms of traction and directional stability on corners. An optional mechanical self-locking rear differential transfers more torque to the wheel with most grip to optimise the car’s traction in any driving conditions. The history of Alfa Romeo is evident in the striking, yet simple, design of the Alfa Romeo Stelvio. Three key Ingredients of Alfa Romeo design are visible in the new Alfa Romeo Stelvio’s exterior: proportion, simplicity and top-quality surfacing. From the legendary cloverleaf at the front end, its compact proportions develop towards the rear and end on a steeply raked rear hatch. Finished with a spoiler, for maximum aerodynamic performance, and two exhaust tips that bring this sporty rear to life. Inside the Alfa Romeo Stelvio, the same sporty elegant imprint is apparent: simple, stylish and tailored like a bespoke suit. Hours of painstaking craftsmanship means the car is jam-packed full of premium materials including full-grain leather, real wood and fabrics carefully chosen for their look and feel. Despite a real focus on styling – both inside and out – the practical layout of the car means the driver is central to everything. This is underlined by the diagonal tunnel, the slightly undulating dashboard and the small leather-wrapped steering wheel that adapts effectively to all driving styles. The driving position and high seat gives complete command of the road, without compromising on the driving pleasure expected of a genuine Alfa Romeo sports car. The feeling of total control is reinforced by the large windows and the wraparound seats give an even sportier, cossetted driving experience. The Alfa Romeo Stelvio guarantees the very best in terms of comfort and versatility in this sector. The 525-litre boot features a convenient electric tailgate that can be configured with eight different setup levels for optimal boot access. Alfa Romeo Stelvio is equipped with the Alfa Connect system – developed in partnership with Magneti Marelli – with the latest-generation HMI interface, which is controlled from the Rotary Pad and the display incorporated in the dashboard. The latest-generation infotainment system not only controls the DAB digital radio but also provides a Bluetooth system for hands-free communication and playing audio from USB and smartphones devices. The entire range is supplied as standard with an 8.8" display with optional Connect 3D Nav 8.8” which supplies navigation with high-resolution 3D maps and high-speed route calculation. The system is also available without a GPS signal thanks to the Dead Reckoning technology, TomTom map updating from the USB port, driving style information and Alfa D.N.A. mode. A sophisticated audio system featuring eight speakers (four woofers and four tweeters) is standard across the range. 10 speakers (four woofers, four tweeters, a mid-range and a subwoofer in the boot), and a 14 speaker Harman Kardon system (four woofers, four tweeters, five mid-ranges and a subwoofer) are also optionally available. Alfa Romeo Stelvio features the new Alfa D.N.A selector, which allows the driver to modify the car's dynamic behaviour with three modes: Dynamic, Natural and Advanced Efficiency (new energy-saving mode). Dynamic mode accentuates performance and reactive handling. The steering response becomes more precise, braking is more immediate and the electronic control systems do not interfere with the pleasure of sports-style driving. Natural mode is ideal for urban and motorway driving; handling is tailored for comfort and fuel economy. And finally, the new Advanced Efficiency maximises energy saving and minimises emissions levels. The new Alfa Romeo SUV is the world's first car in its segment to offer the new electromechanical system that combines stability control with a traditional servo brake. With its combination of electronics and mechanics, this system not only cuts weights, gives an excellent driving "feel" and eliminates pedal vibration but also guarantees instant brake response, meaning a much shorter braking distance. A whole host of safety systems are standard on the Alfa Romeo Stelvio including Forward Collision Warning (FCW) with Autonomous Emergency Brake (AEB), Lane Departure Warning (LDW), Blind Spot Monitoring (BSM), Rear Cross-Path Detection and Active Cruise Control. UK pricing and specification will be confirmed closer to sale start. To find out more about on the Alfa Romeo range, visit www.alfaromeo.co.uk or to locate your nearest Alfa Romeo dealer visit www.alfaromeo.co.uk/find-a-dealer.